Most gardeners are slowing down as the growing season comes to an end and winter rears its ugly head. 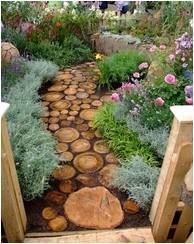 This is a good time to start planning garden paths so the building work is all done when spring planting comes around. 1. 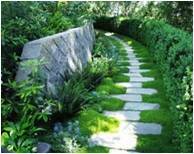 Rectangular slabs placed in an off-set pattern can be used to create a gently curved or straight path. 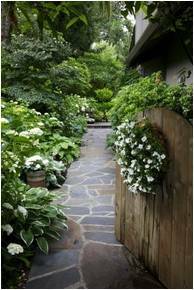 Wouldn’t this look great in a long, narrow lane along the side of the house! 2. 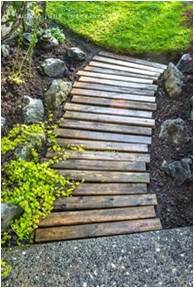 Wooden slats link a paved path to a lawn. If you place the slats a little further apart you can plant low-growing ground cover between them. 3. 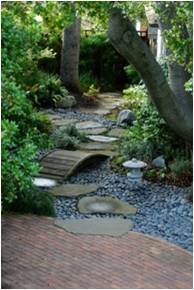 This whimsical look is more ambitious with its combination of a pebble “river”, stepping stones and a little bridge. But it’s a lovely setting for imagination to blossom. 4. Wooden discs have a lovely organic feel about them – and they look great when they start to weather. If you’re getting in a feller to take down a tree, ask him to cut it into wooden discs for a path. Or get discs from your nearest garden centre. 5. You don’t have to rip up a dated crazy paving path – just look what happens when you flank it with a gorgeous, lush garden. It obviously takes a while to establish so use collections of potted plants to give instant elevation while the shrubs grow to a decent height.